• Yorktese / Morkie Dog breeders are listed below alphabetically by State / city. 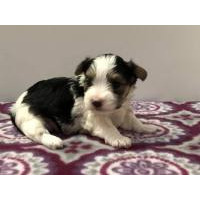 • Click on underlined words to find Morkie puppies for sale. • Please tell the Yorktese / Morkie breeders with puppies for sale that you found them on BreedersClub.net. The Morkie, also known as Yorktese, is a designer breed, a hybrid of the Yorkshire Terrier and Maltese breeds. Though there are no set standards for this breed, some characteristics are desiring human companionship and attention, good deal of energy, small in size, long flowing coat, dedicated to family members. They tend to be wonderful family pets. We have been in different businesses all our lives and dogs have always been a big part of our lives. Our puppies are in the house so they can be played with, we offer the healthiest most socialized puppies you can find anywhere. All of our puppies are Vet. checked, current on vaccinations and worming, micro chipped, and a 1 year health guarantee in writing. We would love to talk to you about our puppies so contact us for more information. Raised in home with lots of love and attention. Well socialized with children. Vet checked with current vaccinations and flea prevention. 1 year written health guarantee. Shipping available at buyers expense. We would like to thank you for considering us on your journey to find that "perfect" puppy for you and your family. If we can answer any questions, please just ask. We are Licensed and Inspected by the State of Illinois. I, my husband and our dogs live quietly in Illinois surrounded by 100 acres of heaven. We are located in Milan which is about halfway between Chicago and Peoria. Our adults and puppies are all raised in doors in a loving environment and are provided with excellent care. They are all placed on a wellness program where they are vaccinated, wormed and vet checked before going to their new forever homes. I spend many, many hours with my adults and puppies which ensures well balanced and socialized puppies. I work very closely with our veterinarian and other breeders who have been invaluable to me!! We here at Pierce's Precious Puppies take Great Pride in producing Top Quality Beautiful, Happy puppies that have strong healthy bloodlines and Great Temperaments. We have been breeding 20 plus years. We have been a member with Breeders Club since 2008. Our dogs and puppies are raised in our home, not kenneled raised. They have plenty of room to run around and are socialized daily. We have our pups vet checked and given an extensive health exam, dew claws removed and tails docked on short tail breeds between 3-5 days old. They will be UTD on vaccinations and worming before they leave at eight weeks old. Pure Breed puppies come with Limited AKC registrations. All our puppies come with a written one year health guarantee. We do not ship our puppies as this is traumatizing to the puppy. We give the utmost love and dedication to our puppies. Beautiful puppies. All our puppies are up to date with shots and dewormings and go to their forever home with a puppy care packet. Puppies are well socialized with children and are from excellent parents. We offer a health guarantee. Cute, cuddly and pre-spoiled! Happy, healthy, little babies that are well socialized. All puppies have been examined by a veterinarian and all vaccinations are current. They have been microchipped & are registered ACA. We love the breed and are committed to the health and happiness of our dogs. We only sell to individual families, no brokers or pet stores. We offer a health guarantee and we do have references. Thank you for looking at my puppies. I take great pride and enjoyment in raising all my babies and finding the perfect home that fits the puppies personality, size and activity level. My kennel has been in business for 16 years and I have always maintained a USDA and MO license with a clean perfect inspection record. I'm constantly attending continuing education seminars to stay on the cutting edge of giving the best possible care of my dogs. I'm a member of several professional organizations in the dog world including MPBA and PPA plus several others. Puppies will be pad trained, up to date on vaccinations, worming up to date and Registered if a purebred dog. I offer shipping by ground or air weather permitting. I give a health guarantee of 1 year against any congenital abnormalities. I also offer microchipping if requested. I've been breeding for 18 years. My puppies are home raised. Handled every day, good with children and other dogs. They are wormed and current on vaccine for their age. My puppies come with a health warranty. I start them on wee wee pads between 4-5 weeks of age. My purebred puppies are AKC registered. I do not ship my puppies . I have 25 + years experience in placing just the right puppy into your household. My puppies are happy, healthy, fun loving, agile and great with children and strangers. They just want to be involved with the family's doings. They are low to no shedding and allergy friendly. They are well suited for apartment life as they can get all the exercise they need indoors but love to go for walks with their master. I HAVE BEEN BREEDING DOGS FOR OVER 15 YRS. WE HAVE A KENNEL BUILDING AND A NURSERY IN OUR HOME. THEY ARE AROUND CHILDREN, PUPPIES WILL HAVE VACCINES AND WORMED. UP TO DATE. SOME REGISTERED AKC AND OR CKC, SOME NON REGISTERED. I HAVE BEEN A MEMBER OF BREEDERS CLUB SINCE 2004. I DO NOT SHIP. . 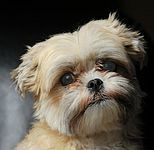 This breed directory page features Yorktese ~ Morkie ~ dog breeders with puppies and/or adult dogs for sale. Once you purchase your new found friend, you will want to provide it the best in pet health care. Be sure to visit our online discount pet supplies catalog and order NuVet Plus™ to keep your puppy and adult dogs in top condition. The discount catalog also features collars, leashes, carriers, general pet care products and much more. BreedersClub.net does not pre-screen the Yorktese ~ Morkie ~ dog breeders who advertise their puppies and dogs for sale in the BreedersClub.net breeder directory and in the classified ads. We require all advertisers to agree to our advertising terms. You should ask the Yorktese ~ Morkie ~ dog breeders you talk with for references from past buyers and veterinarians. Yorktese ~ Morkie ~ dog breeders, you may place an ad for your Yorktese ~ Morkie ~ puppies and/or adult Yorktese ~ Morkie ~ dogs for sale on BreedersClub.net to find qualified buyers.